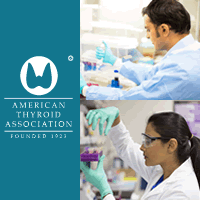 The American Thyroid Association (ATA) has awarded 85 thyroid research grants totaling over $2.2 million since the inception of the Research Fund. In addition, the ATA rigorously manages the selection of research projects and distribution of over $1.8 million generously donated to the ATA specifically for research grants from ThyCa: Thyroid Cancer Survivors’ Association, Inc. (ThyCa) and Bite Me Cancer. For information on other research grants underway and funded by the ATA, see http://www.thyroid.org/professionals/research-grants/thyroid-research-grant-recipients/. The ATA has awarded a 2016 ThyCa Research Grant to Trevor Angell, MD, Instructor in the Department of Medicine, Brigham and Women’s Hospital and Harvard Medical School, Boston MA, for his project entitled “Assessment of Circulation Immune Suppressor Cells for Predicating Treatment Response in Follicular Cell Derived Thyroid Carcinoma.” The goal of this prospective study is to determine whether changes in the levels of myeloid derived suppressor cells (MDSC) in the peripheral blood of patients with thyroid cancer before and after therapy can serve as a predictive biomarker for response to treatment. MDSCs are a type of immune cell that prevents the body’s anti-tumor immune cells from doing their job and destroying cancer. Dr. Angell has proposed that MDSCs, which are rare in healthy individuals but tend to accumulate when cancer is present, can be used for personalized risk assessment and to monitor an individual’s response to treatment in patients with papillary or anaplastic thyroid cancer. The ability to use changes in MDSC levels as a biomarker for disease progression and therapeutic drug response would give clinicians valuable information to guide treatment decisions. ThyCa: Thyroid Cancer Survivors’ Association, Inc. has provided funding in support of 60 special research grants totaling $1,680,000 focused on thyroid cancer and medullary thyroid cancer since 2003. ThyCa supported three research grants in 2016 and three renewing grants; and plans are underway for similar support in 2017. ThyCa is a member of the ATA Alliance for Patient Education. Find out more at www.thyca.org.